Finding the right product which can provide end-to-end service is a dilemma for early blockchain and digital assets adopters. Enjoying the gains of their digital assets such as Dash, BTC, LTC, ETH, CHE and PYN tokens for purchasing food, buying groceries, or cashing out their hard-earned dollars during the time of need are still big issues. They still haven’t found the product for these needs not until now. This is where Paycent comes in. Paycent has created an end-to-end ecosystem which allows blockchain users to manage, store, and transfer their digital assets using the Paycent App and; cash out whenever necessary with the help of the Paycent Card. Users can now enjoy converting their Dash, BTC, LTC, ETH, CHE and PYN tokens inside the app. They can even top up their Paycent Card to use their digital assets for everyday use and purchases. The best part of it all is that the Paycent App and Paycent Card are available globally. 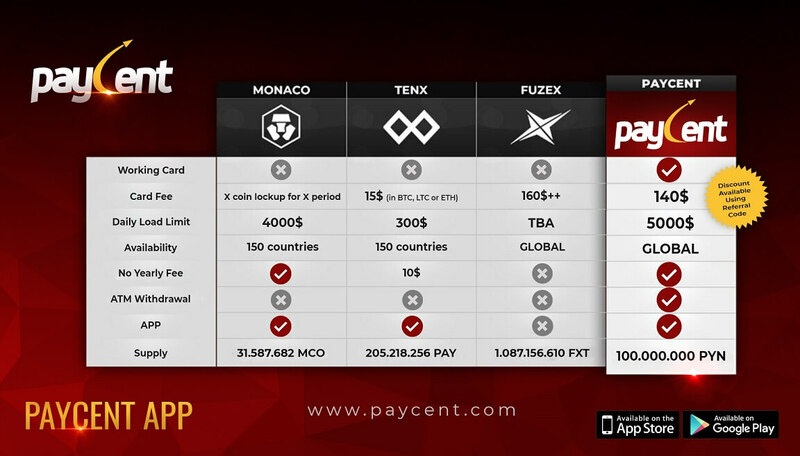 The Paycent Card is the only globally working card in the blockchain market today. Users can order the Paycent Card from the app and may use a referral code to avail a discount during order. The card fee of 140.00 USD includes the activation and courier delivery costs. Also, the card has no yearly fee. Using digital assets is easier nowadays with the use of Paycent. Paycent makes it convenient for people to enjoy both fiat and digital assets anytime and anywhere. Paycent serves as an actual medium for people to bridge the gap between digital assets and fiat. That’s not all! We have more in store for you. Stay tuned for more updates!